Hourai Doll ~ Dolls in Pseudo Paradise (蓬莱人形　～ Dolls in Pseudo Paradise, Hourai Ningyou ~ Dolls in Pseudo Paradise) is an official doujin album by Team Shanghai Alice released on 2002-12-30 (Comiket 63). It is part of "ZUN's Music Collection" and it is the first volume (vol.1). Eight honest people (implied to be thieves) were spirited away to Gensokyo, after one of them found a little hole in a peach tree. Finding themselves in a strange land, they tried to stay together and survive, but each of them start dying. The most curious ran into the depths of the forest and was tricked by a mysterious pierrot, and was beheaded. The earliest to rise walked around a lake, where this person was entranced by the figure of a dancing red-white shrine maiden. It began to rain, developing into a storm, and this person was taken captive by the pierrot and dragged into the storm. That night, the six remaining people held a party. The youngest got bored and walked away, but in the darkness, this person got caught by the pierrot and was immediately beheaded. The most cowardly became paranoid and depressed with the idea that they could no longer return to their world. This person tried to find a way to escape, but eventually gave up and decided to self-hang instead. For some reason, this person survived, and was given a new lease of life, returning to the group. Days later, a shrine maiden saw a blonde girl coming from the direction of the abandoned house in the forest. The girl mischievously stuck out her tongue out and quickly bowed as she laughed and walked away, leaving Gensokyo. The shrine maiden realized that this girl was the only woman of the eight honest men, but paid no mind. 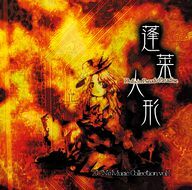 The CD was actually originally released at Comiket 62 on August 11, 2002, alongside Embodiment of Scarlet Devil, but was re-released later at Comiket 63, including a different story from the original. ZUN states in the said game that this CD is meant to be genre-free. Unlike most music which is tuned to 440 Hz, this CD is recorded with a tuning frequency of approximately 456 Hz, which fluctuates by about ± 5 Hz on some tracks. ↑ 1.0 1.1 1.2 These are arranged versions of tracks that were originally available at ZUN's site. The versions from his site were made for the SC-88Pro or SC-8850 MIDI modules, while the versions from this CD were arranged and re-recorded using another module. Recordings of the original SC-88Pro versions can be found here, while recordings of the SC-8850 versions of Eastern Strange Discourse and Reincarnation can still be found at ZUN's music page.